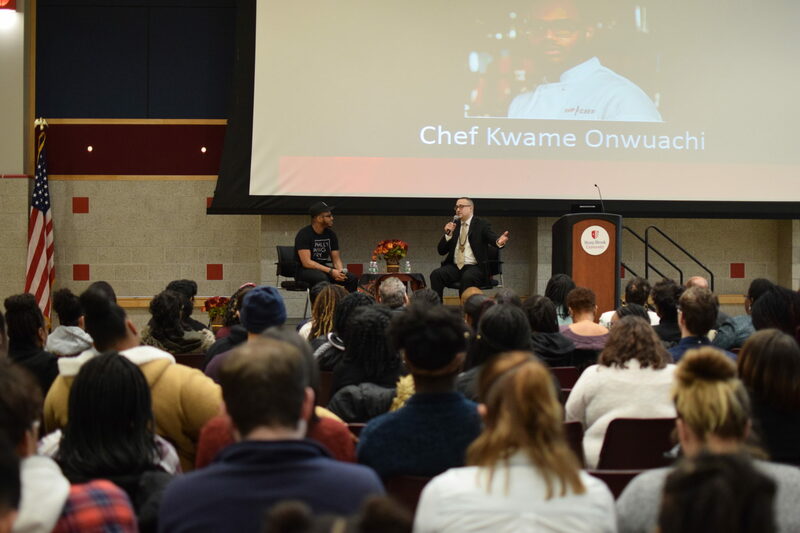 Stony Brook University kicked off 2019’s Black History Month with guest Kwame Onwuachi, a former Top Chef competitor and now owner of Kith and Kin and Philly Wing Fry in Washington, D.C. It was the most attended Black History Month opening ceremony held by the university, Interim Chief Diversity Officer Jarvis Watson said. “It was definitely a success. In the past we’ve had around 100 or 125 people, today we packed the room, we had around 250 people here,” Watson said. The theme for this year’s event, “Blackness is Endless,” is more inspirational than in years past according to students. “I like the approach we took this year, because while last year was about injustice, this year is about inspiration and inspiring,” Spencer Jones, a junior physic major, said. The choice of an inspirational theme continues through to the choice of guest at this year’s event, Chef Onwuachi. Onwuachi, who made the Forbes 30 under 30 list in 2017 for his success in the restaurant industry, started cooking at the age of 6, helping his mother with her new catering business. “I was too young to go and help at the events though, my sister was a bit older so she went and I stayed home with a babysitter and the cooking supplies and those were my toys,” Onwuachi said. Onwuachi, who has toured around the country in cooking competitions and even cooked for President Obama during the Easter Egg Roll, spoke repeatedly about the importance of perseverance in chasing your goals. “[Your dream] will happen a lot faster than you think if you just put your head down and keep working,” Onwuachi said, when asked what words of wisdom he wanted to leave with the students and faculty in attendance. Now Onwuachi runs two successful restaurants in D.C. and has already made a name for himself in the industry. After the speaking segment of the event, students were invited to sample a dish of braised chickpea curry, Afro-Caribbean cuisine from Onwuachi’s Kith and Kin, the line for which stretched almost all the way out of the room. Rayna Simon, a member of the Black History Month Committee and administrative director for Undergraduate Student Government was quite happy with how the event turned out. “Any time you can pack a room like this, you know you’re doing something right,” Simon said. “I enjoyed it a lot and I think having events like these is important because its an opportunity to learn and see different cultures come together,” Carron Allen, the program administrator for SBU’s Medical Scientist Training Program, said. The event, which was planned by the Black History Month Committee, is the first of many events the committee has planned for the month.